The short of it, Southern Tier takes the crown again. Elysian slips a bit. Sam Adams and Blue Moon surprise the hell out of me. More notes after the pic. Light pumpkin nose. Light body, no head, nice orange clear color. Barely any pumpkin. 5.7% ABV. No head, barely orange. No pumpkin in the nose. Can’t taste the pumpkin. 5.2% ABV. No head, slight orange color. Light pumpkin nose. Spicy body with little pumpkin flavor. 7.0% ABV. Nice head, cloudy orange color. Smooth, easy drinking. Not a lot of pumpkin. Hints only. 4.0% ABV. Beautiful beer. Deep burnt sienna color with creamy head. Minimal nose. Toasted flavor in the body, spices for sure. Very light pumpkin. 5.7% ABV. 17 lbs per barrel. Light yellow color. Small light head. Spicy nose. Spicy body. Light on the pumpkin, not as creamy as past years. 8.0% ABV. 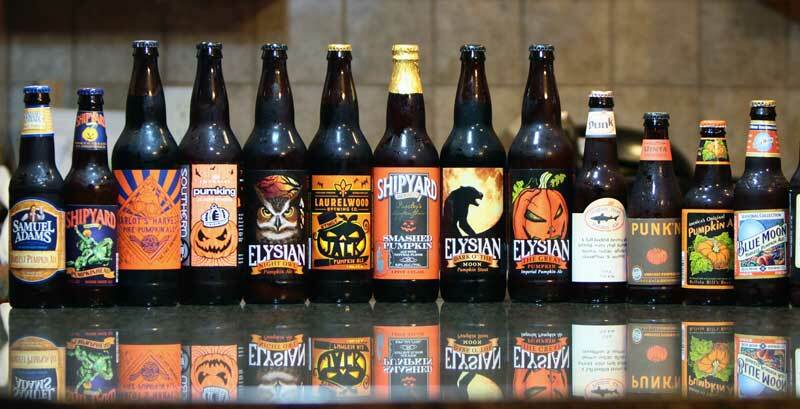 This entry was posted in Pumpkin Ale and tagged Blue Moon, Buffalo Bills, Dogfish Head, Elysian, Laurelwood, Pike Brewing, Pumpkin, Pumpkin Ale, pumpkin beer, Pumpkin Beer 2012, Samuel Adams, Shipyard Brewing, Southern Tier, Uinta Brewing. Bookmark the permalink.